Read through this blog list and discover personal experiences about what it is like to live and teach abroad. Blogs are a great way to write about your adventures abroad and stay in touch with friends and family back home. If you have a blog and would like us to add your site to our list, please contact us and we would be happy to do so! Reach To Teach recognizes these China bloggers as being at the top of their game in terms of providing great China travel content, as well as useful and fun information for ESL teachers interested in teaching English in China. Julia Yeager in Shanghai – A Reach To Teach teacher in Shanghai. Nichol’s Away – My journey through new countries, cultures, and my experiences along the way. Reach To Teach recognizes these South Korea bloggers as being at the top of their game in terms of providing great South Korea travel content, as well as useful and fun information for ESL teachers interested in teaching English in South Korea. Korealizations – Nathan Magyar’s vlog on living, teaching, and traveling in South Korea. Tales of a Travel Addict – Teacher Lisa Vinish’s tales of running from the mundane since 1985. Breathtaking Busan – An American expat living and teaching in Busan, South Korea. McHosey: Adventures of the Seoul: Caroline Hosey’s teaching adventures in Seoul, South Korea. Midwest to South Korea – After a year of doing what you’re supposed to do after you graduate and working the 9-5, I’ve had enough. I’m ready to feed my curiosity and begin to see the world. Seoul Patch – Follow a middle-aged American teacher, writer and soccer coach as I embark on a journey to teach English in Seoul, South Korea. Texan in South Korea – An African American Texan living in a Korean world. Through The Windows of My Seoul – Two teachers from outside Chicago, Illinois wandering halfway across the world because we want to find something out about ourselves and our teaching. Reach To Teach recognizes these Taiwan bloggers as being at the top of their game in terms of providing great Taiwan travel content, as well as useful and fun information for ESL teachers interested in teaching English in Taiwan. My Several Worlds – A former Reach To Teach teacher, Carrie Kellenberger is now a successful freelance writer and photographer living in Asia. She is also co-owner of Reach To Teach Recruiting. Her award-winning site features information on travel destinations around the world, including Taiwan. In addition to her travel articles, Carrie also offers an excellent resource section for ESL teachers on MSW. 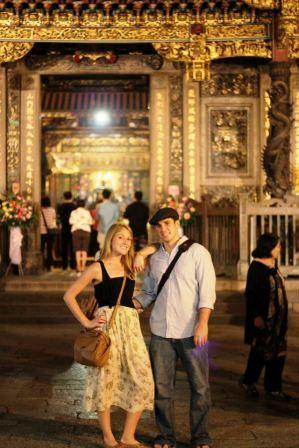 Internationally in Debt – Zach and Shay tackle debt in Taiwan, among other things. Traveling Vanilla Bean – I’m young, curious and excited. The world is just sitting there waiting for you to explore it. You should live in a way that makes you come alive, and that’s what travel does for me. To see your teaching, language, Asia travel or other related site listed here for free, FIRST add a link to our site from yours using the details provided below (scroll down a little further for the actual HTML link code). Once you’ve added our link, write to us at info@reachtoteachrecruiting.com to let us know it’s there and we’ll place your link asap. Description: Reach To Teach helps you find an ESL teaching job with a reputable school that meets our standards for high quality English teacher positions in destinations all over the world.